Long long ago and far far away, I was a partner in a cheesecake company called, The Uncommon Cheesecake. We made the most incredible cheesecakes, ultra creamy (NOT dry, gummy New York style) in interesting flavors for the time: Grand Marnier, Cappuccino, and Candied Ginger to name a few. We did not make white chocolate cheesecake, however. Then one day my step-dad, DaddyMike, sampled a prototype in a Northwest restaurant and liked it so much that he asked me to “figure it out” for his birthday celebration. After playing around with the amount of white chocolate a bit, I perfected it to his satisfaction. He says this is the best cheesecake in the known world. The original was topped simply with white chocolate shavings, but for Valentine’s Day this year I am adding a raspberry rose petal topping. It really sends the dessert over the moon for me. I mean: Raspberries! White Chocolate! Rose Petals! Together! I will try it out on DaddyMike when he and Mom head back to the Northwest from the Southwest this spring. Yup, they’re a couple of those lucky SnowBirds. But you’re going to feel lucky too when you’re eating this cheesecake. This is a creamy-style cheesecake. It should not be dry, gummy, or grainy, which is the result of over baking. Trust the baking times specified below. They are correct and will give you perfect results. SERVING NOTE This cheesecake is really rich. DaddyMike can eat the whole thing, but most people prefer a slender slice. To make the cookie base, put the cookie crumbs in a small bowl and stir in the melted butter. Sprinkle the cookie crumb mixture on the bottom of a 10-inch springform pan, removable-bottom cake pan, or divide between four 1½-cup capacity heart-shaped springform pans. The crumb coating will look sparse. That’s intended. To melt the white chocolate, put the chocolate in a small glass bowl and microwave for 30 seconds. Stir with a wooden chopstick or handle of a spoon and if the chocolate does not melt fully, continue microwaving in 10-second increments until the chocolate is creamy. This should not take longer than 50 seconds or so. NOTE White chocolate cannot tolerate the same degree of heat that dark chocolate can. If it is overheated, it will turn granular. To make the cheesecake batter, in the workbowl of a processor fitted with the steel blade, process the cream cheese with the sugar until completely smooth. Add the eggs and melted white chocolate and pulse to combine well. Pour the batter into the prepared pan or pans and bake at 350º for 20 minutes for the large cheesecake and 15 minutes for the smaller cheesecakes. Remove from the oven and let rest for 5 minutes. The cheesecake will not appear set; that’s as it should be. 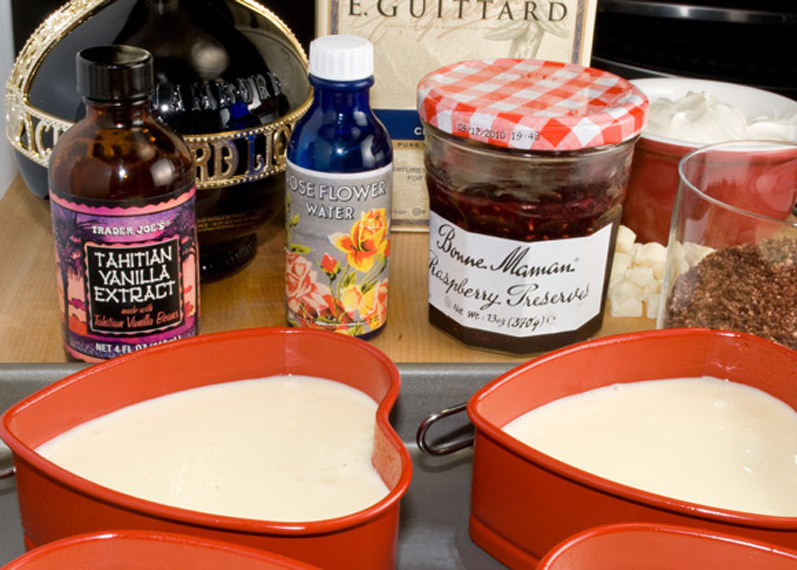 To make the sour cream topping, while the cheesecake is baking, in a small mixing bowl, whisk the sour cream with the sugar and vanilla, and let set until the sugar is completely dissolved. Slowly, so as not to disturb the cream cheese layer, pour the sour cream mixture over the top of the cheesecake or cheesecakes. Return to the oven for 10 minutes for the large cheesecake and 8 minutes for the smaller cheesecakes. Remove, and let cool to room temperature on a wire rack. Cover and chill for at least 6 hours and preferably overnight. To make the raspberry topping, in a small saucepan, bring the jam just to a simmer, whisk in the liqueur until smooth, strain through a fine strainer, let cool just slightly, then spread on the chilled cheesecake or cheesecakes (still in the pan) to evenly cover the top. Refrigerate until the topping is set, about 1 hour. To serve, remove the outside ring of the cheesecake pan, position the cheesecake on a serving platter. Remove the outer ring of the springform pan or removable bottom cake pan and position the cheesecake on a doily-lined serving plate. 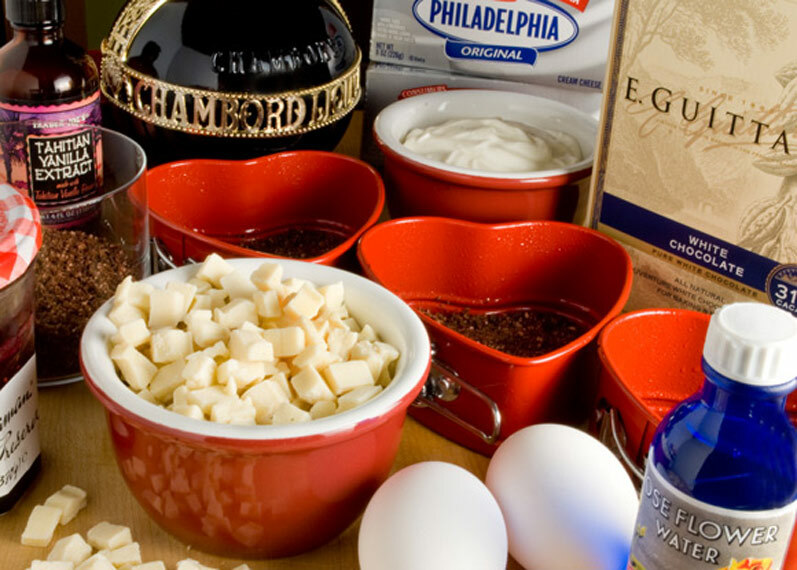 Grate the remaining white chocolate and sprinkle around the cheesecake. Serve chilled. Use a serrated knife to cut slices from the large cheesecake. Copy­right 2011 Susan S. Bradley. All rights reserved. I’ve been making this amazing cheesecake in special occasions and lat night I made this for today’s Father’s Day. It’s my husband and son’s favorite cheeesecake of all time! I’m going to shave some Valrhona white chocolate and planning to add some dried roses as garnish to make it extra special. Thanks again Susan!! How fun that you used to be a partner in a cheesecake company! It looks like you nailed the white chocolate cheesecake! White chocolate is the exception to my no chocolate and fruit rule. I LOVE white chocolate with any acidic fruit–berries, citrus, etc. I could also see this topped with lemon curd–YUM. Also, this is just flat out gorgeous–you must have awesome hands! I’m a huge cheesecake fan! And raspberries and rose petals?? LOVE it. This was by far the most amazing, wonderful cheesecake I have ever had (& I have had plenty in my 60-some years! )…my guests didn’t really like white chocolate; but, I’m sure my SIL will flip over this when I make it for her b-day. Thank you!!! I even bought rose water just for this…and, it was worth it!! Gypsybaker, oh you wonderful person you! 🙂 So glad you enjoyed it! I just made this yesterday and my whole family loved it! Great recipe, looking forward to make more from this website! Thank you so much! i made this amazing cheesecake twice already and my husband and my son loved it!! they still finished it just in 1 day, even though my sour cream topping was tart..can i omit the sour cream? So glad you like it, Rodger. 🙂 Did you see the Print this Post button at the bottom of the post? Unfortunately, I have found no simple way to make available a way for readers to print only the recipe. The CopyScape Do Not Copy notice on the site is a protection of copyright statement. You may copy the recipe for your own use. However, if you wish to share it with others, please refer them to the website. Thank you for asking! Posted a link to your website on Ravelry.com, got a question back about what kind of rose petals to use. No real rose petals were used in the making of this recipe, right, just rose oil or rose flower water? Thanks. Have you ever had rose petal jam? I had it once as a child,it was awesome! I made this cheesecake for Easter Sunday. Instead of the raspberry topping, I subbed a homemade strawberry jam topping. Thanks for this wonderful recipe. Everyone LOVED it. The raspberry topping takes this waaay over the top!Made it for family today–Rave reviews! Thanks so much! 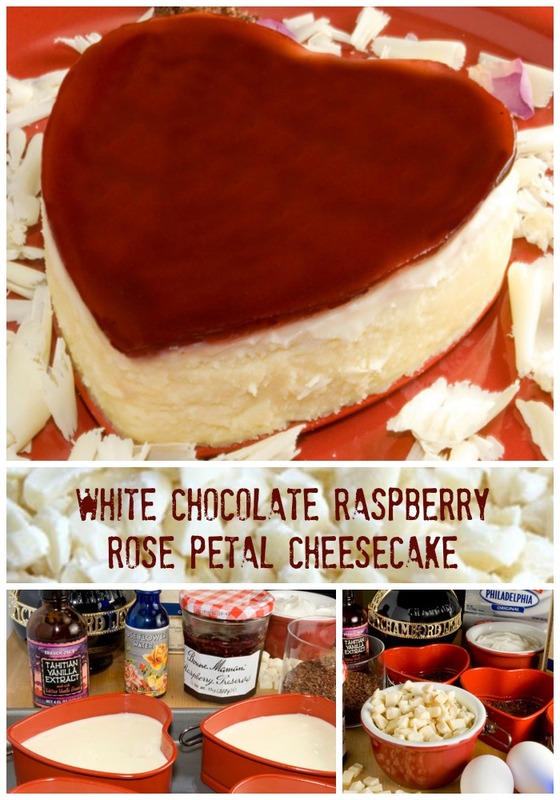 I love the idea of white chocolate cheesecake! I’ve seen lots milk and dark chocolate cheesecakes but not this. Sara, it’s funny you should mention this. As I was perusing the row of chocolate cookbooks in my studio, I was struck by the near absence of white chocolate desserts. The same goes for the Northwest restaurant dessert landscape, which I will post on next week. Then I remembered that I created this white chocolate dessert for DaddyMike long ago. I hope to use white chocolate more this coming year. Hey, there’s no need for a waterbath if i use a 10-inch springform?? Will it crack??? cant wait to try it! L, I’m so glad you bring this up! Every time I see a cheesecake recipe that calls for a waterbath, I shudder. There is absolutely no need for such measures if you do not overbake the cheesecake. Many recipes call for 45 minutes, an hour, or even longer. EEYIYI! Remember, the cheesecake should NOT look done when you pull it from the oven. It will continue to cook and set up for another 15 minutes or so. Try this, trust the timing specified and then tell me what you think. heyy yep, no cracks =) Really liked the white choc cream cheese layer.. but the sour cream layer was abit too.. tart and soft for my liking! Is it supposed to be like that?? Hmmm…No, it sets up very nicely usually. Did you use regular (rather than reduced fat) sour cream? The sugar, you can of course increase to your liking. I like it to contrast a bit with the sweet, rich cheesecake. WOW! I cant wait to try this out! Adrian, thank you! I hope you try it. This cheescake is a breeze to make and virtually failproof (just don’t overbake it). Your cake is just gorgeous, and I love the flavor combination of white chocolate and raspberry. It’s especially good in cheesecake! Sara, thank you! My original version of this cheesecake is a bit too rich for me but with the addition of a little acidity (raspberry topping), I can eat an ENTIRE serving. Not sure whether to be happy about that or not. Divine! I wish I had those little cake pans too! LOVELY! Eunice, thank you! I got the red springform pans at Sur La Table for $2.50 each. They do leak just a bit, however. They had better ones (not in red) for around $12 each, which of course is quite a bit when you need four of them. Thank you for visiting my blog! I adore those heart-shaped spring pans, and that cake looks divine. Brilliant! I once had a rosewater creme brulee and it was amazing, but I bet this is even better. Cynthia, thank you! I must confess that I am now officially addicted to the flavor of roses. My favorite tea is The Republic of Tea’s Rose Petal Tea (this my moniker RosePetalTea). I used rose flower water in this recipe because it is easier for most folks to find. I more often use essence of rose oil (culinary grade). It is extremely intense, however, so if you want to use it, start with one drop. 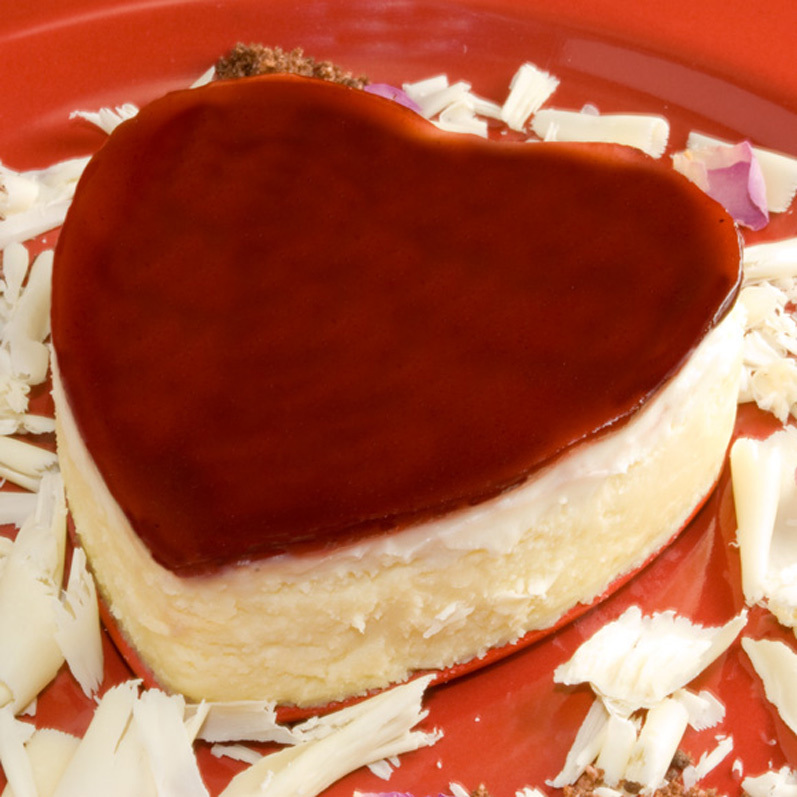 That Cheese cake has to be one of the most stunning Valentine cakes I’ve ever seen. Love it!